Burdock has an ancient and respected reputation as a nutritive liver tonic that helps to clean and build the blood, while its diuretic action of burdock helps in the elimination of waste materials. Taken internally, this root promotes sweating and the elimination of harmful high levels of uric acid via the kidneys. 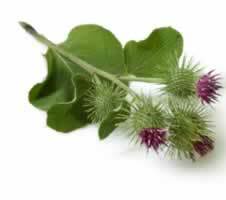 Burdock tea is good for any skin condition that would benefit from detoxification. Blends well with dandelion root as a tonic drink for the liver. Recipe Instructions: Decoction :Simmer 1 tablespoon of dried root in 2 cups of water for 20 minutes. Drink up to 4 cups daily. Tea can also be used as a skin and face wash. Apply the cooled tea to the skin with a clean facecloth, and rinse in cool water. Detoxification :Regular use of depurative herbs will help detox your body and most importantly support your liver. Poor liver function is one of the most common root causes of poor health. Diabetes :Healthy herbs in the kitchen work along with a healthy lifestyle to help prevent and manage diabetes. Baked goods are more diabetic friendly with spices like cinnamon used to lessen the need for sugar. Skin Care :Natural, organic skin care remedies do a better job of protecting and healing skin than store bought cosmetics.